Back in 2014 EASST partner Hayat NGO launched the first phase of its project to increase the use of child restraints in Azerbaijan. The project aimed to clarify and amend the law on child restraints and encourage the correct use of child restraints among families. Failure to correctly use a seat-belt or child restraint is a major risk factor for road traffic deaths and injuries among vehicle occupants. While seat-belts and child restraints do not prevent crashes from taking place, they play a major role in reducing the severity of injury and dramatically increase the chance of survival. Often, however, use of child restraints is limited as a result of cost, poor enforcement, lack of awareness and/or a lack of clear guidelines and legislation on the issue. In 2014 Hayat conducted an initial survey among families with children under 12 years old and found that only 17 per cent used child restraints in their vehicles. It was also found that the law on child restraints in Azerbaijan contained no specific details relating to the positioning of restraints, the height and age of the child, and the type of vehicle. As such, Hayat began conducting awareness-raising events, reaching 20 local schools as well as hospitals and maternity wards. Posters and booklets were widely distributed among young families containing guidance, which were accompanied by online and radio messages to the general public. In close cooperation with the State Traffic Police Department, Hayat sought to clarify and amend the existing law on use of child restraints. They held a key meeting with MPs and the Chairman of the Parliamentary Social Policy Committee which led to the drafting of an action plan to provide greater clarity in the law and increase controls over enforcement. While the action plan has not succeeded in changing the law yet, the project has, for the first time, successfully initiated discussions between state agencies, non-governmental organisations and representatives of private enterprises on the use of child seats in vehicles in Azerbaijan. The initial awareness-raising campaign was estimated to have reached many thousands of families and individuals, and amendments to the existing law plan were submitted to the Parliament of the Republic of Azerbaijan following joint agency working. 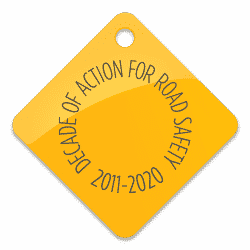 Since 2016, EASST has also worked with FIA mobility club the National Automobile Club of Azerbaijan (AMAK) to promote road safety in the country. AMAK has too taken up the mantle of promoting child safety by supporting and continuing the work of Hayat on child restraints. In 2017, AMAK updated the earlier survey and found that 85 per cent of parents were aware of the importance of using child restraints but that in practice (although there had been an increase in use since 2014) 66 per cent of parents still did not use them in their cars. What’s more, 100 per cent of parents agreed that government policy in this area should be stronger. Now, with the support of organisations such as the FIA Foundation, the Global Alliance of Road Safety NGOs and EASST, AMAK and Hayat are building on the increased awareness and use of child restraints and using the basis established in 2014 to collaborate with local stakeholders and policy makers including the National Road Safety Council and Road Police to advocate for changes in policy and legislation around the use of child car seats. Their goal is to further increase the use of child restraint systems in cars, and successfully implement legislative amendments so that, as a minimum, the use of child restraints in the back seat of cars is mandatory in Azerbaijan by 2020.